Angus and Tony walk you through what to do with your videos once you’ve made them. How do you get people watching them AND taking action. Angus and Tony discuss how you can be creating 90 days worth of videos in half a days work. Batch it!! Would you like to be making engaging, entertaining, patient attracting videos for your practice? Angus and Tony discuss in detail The 5 part Video Framework that’ll have you pumping out great videos that position you as the expert, the go-to Doc in your community. Episode 8 – The 2 types of videos you need to be making. Angus and Tony discuss the 2 types of videos you need to be making for your practice. 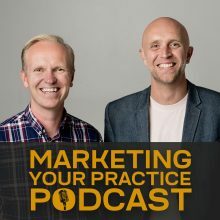 Join the Marketing Your Practice Podcast by subscribing in iTunes or Stitcher. Angus and Tony got through a simple 4-step process to creating an endless supply of content so you can position yourself as an expert. Episode 6 – Should we build an email list? Angus and Tony discuss the pros and cons of building an email list. Tony and Angus discuss the 3 questions you need to answer with every piece of content you put out. Episode 4 – The 4 P’s to a Thriving practice. Join Drs Angus Pyke and Tony Rose as they discuss the 4 P’s to a thriving practice. Episode 3 – Top 4 lessons learnt from interviewing 10 social media experts. Join Angus and Tony as they discuss the biggest lessons coming from those interviews. Episode 2 – What we learnt from a social media master. Join Angus and Tony as they share their lessons learnt from interviewing Lola Berry about her social media journey.